Meeting Sir Garfield Sobers | The International Cricket Hall of Fame. There are names in cricket which command immediate attention among the copious lists and inventories from years past. Bradman, Hammond, Worrell, Gavaskar, I. Chappell, Trumper, Grace are all synonymous with the game’s DNA. Growing up in the 1960s however there was one name that, alongside Bradman, was most-quoted by those of my family who were cricket literate. A fearless, graceful and ridiculously talented West Indian who could bat, bowl and field like no other – Garry Sobers. Sadly I was too young to remember his lithe athleticism and his wristy, whippy punishing left-handed batting. He bowled fast or, as the game demanded, rolled out orthodox or unorthodox spinners. 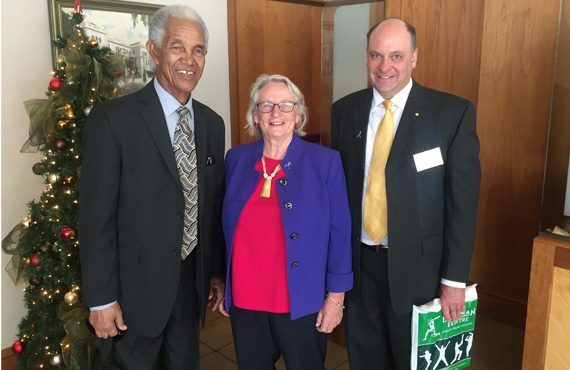 A dream came true when, together with Bradman Foundation Chairman Maurice Newman and Executive Director Rina Hore, I met and interviewed Sir Garfield at a corporate lunch in Brisbane on Tuesday 13 December 2016. He batted down the order and invariably accelerated the scoring when his team most needed runs. The jaunty Barbadian faced the searing pace of a youthful Dennis Lillee when captaining the Rest of the World XI on the WACA in 1971-72 and was sent packing to the pavilion after just two deliveries. Unintimidated, during the Australian innings, his retort was a quick bouncer to the great bowler and soon after his wicket. The stage was set for Lillee’s response in the following game in Melbourne but try as he might Garry Sobers dispatched him and his fellow Australian’s to all corners of the MCG. He departed only after he had made 254 runs and in doing so indelibly inscribed his talent on a whole new generation of Aussies. An enraptured Sir Donald Bradman described it as the best innings he’d ever seen in Australia. We met him in the 19th Century colonial surrounds of the Queensland Club where he was staying. Sitting erectly on a leather lounge surrounded by wood panelling, squeaky floorboards overlain by Axeminster carpets, he welcomed us wearing a beautifully tailored suit and wrap-around dark glasses. As expected he was an absolute gentleman and possesses an almost regal bearing. I discovered Sir Garfield loves golf. He doesn’t watch much cricket these days and prefers to be honing his skills on the fairways and greens – eighteen holes each and every day. ‘It is the hardest game of all’ he says, and relishes the freedom and challenges that it provides. On Barbados there are five courses all close to the Sobers home. ‘Is Brian Lara in Australia at the moment?’ he asks, ‘Brian loves his golf too’. Sir Garfield recalled his days playing for South Australia – three seasons in the early 1960s. In the wake of the glorious 1960-61 Australia v West Indies series which spawned the first tied Test in cricket’s history and forged lifelong bonds of friendship between the opposing sides, three West Indians returned to Australia the following season to play in the Sheffield Shield – Wes Hall (Qld), Rohan Kanhai, (WA) and Sobers. ‘I remember Sir Donald (Bradman) waking me up in the change room – I used to catch up on sleep when we batted – ‘You must make a century today Garry’ he said on more than one occasion ‘our team is collapsing’. ‘Because it was Sir Donald asking I would always do my best’ he explained. And his best was just that. Sobers made 1000 runs and took 50 wickets in two of the three seasons he played with SA. This giant of the game is a humanist first and foremost. When speaking of his colleagues he was at his most animated and sincere, preferring to recall their sporting achievements rather than his own. ‘Have you heard of Cec Pepper?’ he asked (Member of the Australian War Services XI 1945). ‘Now he had a better flipper than Shane Warne, his hands were so strong he squeezed the ball out the bottom like an orange. And he could bat too. Had he not left to play (a record breaking career) in the Lancashire League he would have had a Test record superior to mine.’ Earlier in the week we were told that Sir Garfield had held rooms of 400 people spellbound and ended his presentations to standing ovations. To see the room of senior business men and women who were all children when Sir Garfield was etching himself into our collective memory, gazing starry eyed at their hero was both compelling and memorable.